The nosebleed, called in medical epistaxis, is a very common situation, which comes to affect more than 60% of the population at some point in life. Despite scare, the nose bleeds rarely cause any significant complication. In the vast majority of cases, the blood loss can be easily controlled at home without medical assistance. The nasal cavity is highly vascularized and their vessels are relatively superficial, especially in the most anterior region of the nose. The nosebleed is usually ranked epistaxis previous and posterior epistaxis. Epistaxis previous shot is the most common form of nose bleeding. It arises when there is damage to the vessels in the anterior region of the nasal mucosa closer to the nostrils. In this region several small arteries are attached, form a tangle known as vascular plexus Kiesselbach, which is a very fragile site, which bleed easily. 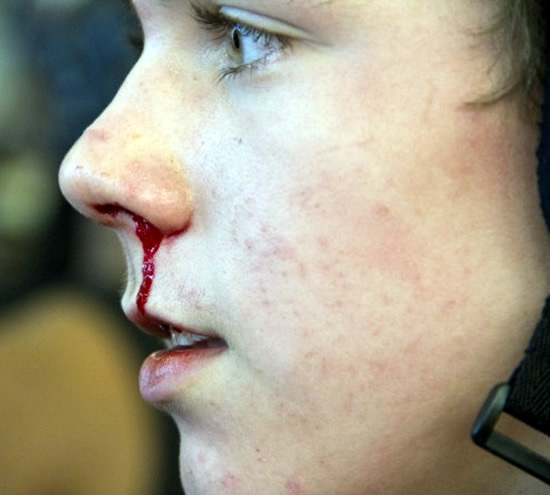 The posterior epistaxis is more rare, accounting for only 5% of cases of nosebleeds. Although less common, subsequent bleeding usually more bulky and unwieldy. The few cases of epistaxis who need urgent medical care are usually those that originate in the posterior region of the nasal cavity. The epistaxis is more common in children under 10 years and in adults over 45. This does not mean in any way that adolescents and young adults may not have nose bleeds. What are the causes of nose bleeding? Most cases of epistaxis arises by trauma to the nasal mucosa. The act of putting your finger inside the nose to take snot is the main cause. When the humidity is too low, the nasal mucosa is more dry and irritated, making on-site injuries become more easy to occur. People who spend the day indoors with air conditioning or heating on are the most prone to having nose bleeds. Infections of the airways or allergic conditions which cause irritation of the nasal mucosa and rhinitis are also risk factors for epistaxis. People who have suffered trauma to the face, such as car accidents or physical assaults, may go on to have nose bleeds intermittently. Patients with deviated septum also usually have more episodes of nasal blood loss. In young children, the presence of a foreign body (type grain of rice or beans) inoculated into the nose without parental knowledge can be the cause of bleeding. The tip is the presence of blood accompanied by purulent discharge. Patients on medications that interfere with blood clotting, and anticoagulants heparin or warfarin are also at increased risk of epistaxis. Drugs used to decrease the action of platelets, such as aspirin (ASA) and clopidogrel also increase the risk of bleeding, but not as much as anticoagulants. Patients with chronic use of intranasal corticosteroids are also at higher risk. Similarly, overuse of nasal decongestants can also irritate the lining of the nose, favoring epistaxis. Cocaine users often have the nasal mucosa and bleeding from the nose. Tumors of the nasal cavity usually cause bleeding, but fortunately, they account for only a minority of cases of epistaxis. Less common causes include frequent nosebleeds coagulation diseases such as hemophilia or von Willebrand disease, and malformations of vessels in the nasal cavity, as in Osler-Weber-Rendu disease. Although popularly accepted, hypertension does not appear to be the cause of epistaxis. There is no consensus in the medical literature, but the current trend is not to consider hypertension as a trigger of nosebleeds. What often occurs is the increase in pressure after the start of bleeding, anxiety due to blood loss, the bulky often causes the patient. What to do when the nose bleed? The vast majority of nose bleeding is self-limiting and can be controlled at home. While trying to stop the bleeding is important to prevent the blood from flowing back later, heading towards the pharynx, which favors its swallowing or even its aspiration into the lungs, if the bleeding is too bulky. Therefore, the act of lifting the head or lie down with the nostril capped by a pad of toilet paper, cotton or gauze is wrong. This does not speed healing and can even cause the patient to swallow or aspirate the blood, especially in the case of children. The correct way to staking a nasal bleeding is to sit, slightly tilt the trunk and head forward and the thumb and index finger squeezing the nostrils by hand from the outside, in order to cover the output of blood. Hold down the nose for at least 5 minutes without interruption. Do not be taking finger pressure all the time to see if the bleeding persists. Cold compresses on the outside in the nose can also be used. If after 5 minutes the bleeding persists, repeat the operation, now keeping the pressure for 10 to 15 minutes. After the cessation of bleeding, stay home for at least 1 hour. Do not blow your nose and do physical exercise for the day. Try to keep your head above heart level (do not pour or put your head between your legs) to reduce blood pressure in the vessels of the nose. If after 20 minutes of compression nasal bleeding persists, or if nosebleed, bleeding is too bulky from the beginning, seek medical help. Epistaxis that arise after head trauma. Recurrent epistaxis, which come and go throughout the day, for several days in a row. Patients using anticoagulants that have nosebleeds should seek medical attention to evaluate the possibility of poisoning by coagulants. If the patient has undergone a surgical procedure on the face recently. Nose bleeds that come along with fever and / or headache. The chemical etching is a process in which the doctor uses chemicals to "burn" the bleeding vessels and stop the bleeding from the nose. Initially, it was placed in the nasal cavity a cotton ball soaked with local anesthetic and a vasoconstrictor to reduce bleeding. Then use a cotton ball soaked with trichloroacetic acid or silver nitrate to cauterize the bleeding region and its surroundings. The electric cautery is commonly used when the chemical cauterization can not completely stop the nosebleed. It is a painful procedure that needs to be done with adequate local anesthesia. With the endoscope use it is possible to directly visualize the bleeding points in the nose. Both forms of cauterization may be used (chemical or electrical). It is a more effective way to control the most posterior epistaxis. If cauterization techniques described above fail, the doctor will attack the nasal packing to stop the loss and nose bleeds. Buffers are a synthetic foams made especially to absorb blood and stop bleeding. Once implanted into the nasal cavity, the cap may be filled with saline in order to expand and compress the vessel wall with bleeding. The cap is usually removed after 48-72 hours. If all else fails, surgery for ligation (usually endoscopically) or embolization of the arteries that nourish the nasal cavity is the alternative left.